The history of mountaineering has been to a large extent the ongoing conquest of the unknown and the impossible. In this pursuit, “firsts” are the holy grail of alpinism: first ascent, first traverse, first ski descent, first female ascent of all 14 “eight-thousanders” (maybe). Achieving the unprecedented can be a remarkable and inspiring feat, but this fetish for firsts has, at times, served less noble ends as well. 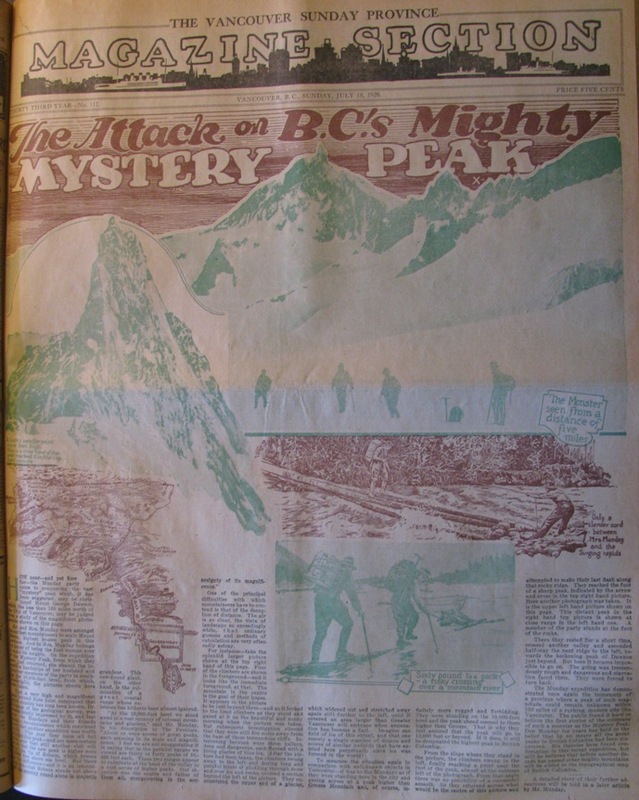 Scholars such as Peter Bayers and Reuben Ellis have examined mountaineering literature from a post-colonial perspective, identifying how the act of mountain climbing could serve as a powerful symbol of the conquest of new lands and people, energizing colonial enterprise while reinforcing racial and cultural chauvinism. Mountaineering narratives, even those lacking this overt imperialist rhetoric, have obscured previous human presence in the landscape. It was often assumed that only the modern European mountaineer had the vision to fully appreciate sublime mountain landscapes, and the ability to conquer them. Efforts have been made in recent years to address this erasure, through the subtle nomenclature of “first recorded ascents,” or though place names: Mount McKinley becomes Denali; Mount Everest becomes Chomolungma (Tibetan) or Sagarmatha (Nepali); Mount Robson becomes Yuh-hia-has-kun. Some academics are now reassessing Indigenous people’s relationship with alpine environments as well. Around these parts, this work is best represented by SFU Archaeologist Rudy Reimer, whose high-altitude archaeological studies in Garibaldi Park are complemented by research into the oral history of the Squamish First Nation. He has found ample evidence that for hunting, berry-picking, obsidian mining, and other practical and ceremonial purposes, First Nations excursions into the alpine were far more extensive and sophisticated than previously assumed. 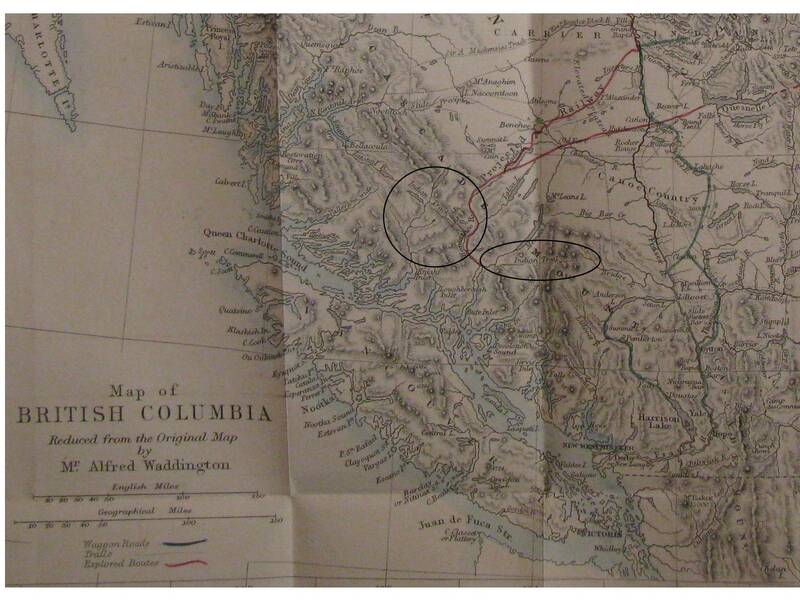 As part of my ongoing master’s thesis research–on the history of exploration in British Columbia’s Coast Mountains–I was recently looking at a map from Alfred Waddington’s 1868 pamphlet for the Royal Geographical Society, entitled “On the Geography and Passes of British Columbia…” (see image below). Detail from Alfred Waddington's 1868 map of coastal British Columbia. 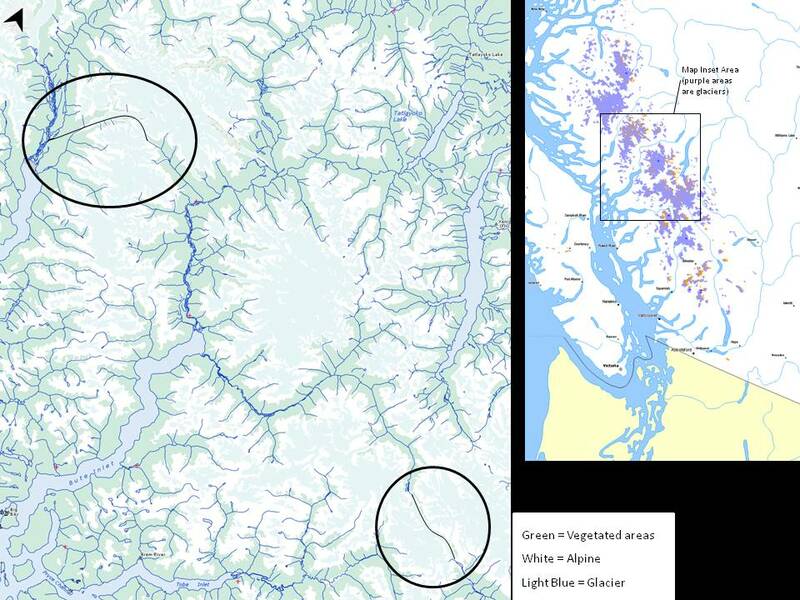 The map indicates two “Indian Trails,” in the heart of the Coast Range. One of the footpaths linked the Homathko and Klinaklini River valleys–and perhaps continued to South Bentinck Arm–while the other connected the upper drainages of the Southgate and Bridge Rivers. Mapmakers at the time knew little, if anything, about the high terrain these trails would have crossed. Knowledge of the river valleys, however, was detailed enough at the time to assume that the paths as marked on the map were fairly accurate. Most likely, the trails were drawn through these blank spots based on information that surveyors had gathered from their native guides. Possible trans-icefield travel routes. Clearly, I need to learn GIS. Both routes would necessarily have crossed directly over major icefields–the west side of the Waddington Massif and the Franklin Glacier, and the Lillooet Icefield, respectively. When, in the 1920s, mountaineers began exploring the region’s massive icefields–several times larger than those along the Icefields Parkway in Banff and Jasper National Parks–it was widely assumed that they traveled where no human had tread before. I have long suspected that First Nations people in the Coast Range used the icefields as “alpine highways,” much the same way that Tlingit and Tagish people did in the St. Elias Mountains, as discussed by Julie Cruikshank in her book “Do Glaciers Listen?” This is the first bit of documentary evidence that I have found to support this hunch. Across continents and centuries, mountains have always had a powerful effect on local people. Responses have varied from fear to veneration, but never apathy. We should be open to the idea that a fascination with alpine landscapes, and a human presence within them, is far more cross-cultural than past mountaineering literature has often assumed. Bayers, Peter L. Imperial Ascent: Mountaineering, Masculinity, and Empire. Boulder: University of Colorado Press, 2003. Cruikshank, Julie. Do Glaciers Listen? : Local Knowledge, Colonial Encounters, and Social Imagination. Vancouver: University of British Columbia Press, 2005. Ellis, Reuben. Vertical Margins: Mountaineering and the Landscapes of Neo-imperialism Madison: University of Wisconsin Press, 2002. Munday, Don. The Unknown Mountain, ed. Angus M. Gunn. Lake Louise, Alberta: Coyote Books, 1993. Reimer, Rudy. “Alpine Archaeology and Oral History of the Squamish,” in Archaeology of Coastal British Columbia: Essays in Honour of Philip M. Hobler, ed. Roy L. Carlson. Burnaby, BC: SFU Archaeology Press, 2003. You will, I expect, have heard of the so-called Mackenzie Grease Trail through the Coast Mountains, which rises over alpine terrain, although it was a route through, not necessarily to, the adjacent Rainbow Range (Tweedsmuir Provincial Park), B.C. Similarly, in and round the Spectrum Range of Mt. Edziza Provincial Park (of similar geologic origin), can be found numerous pre-historic obsidian quarrying/flaking sites used by the local Tahltan. Archeological studies have traced the distribution of obsidian from both these sites along trade routes hundreds of miles away.